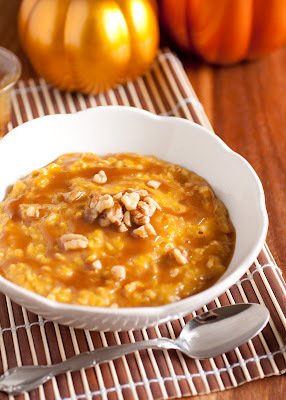 What do you get when you combine oats, pumpkin, caramel, and walnuts along with some sweet spices? You get a nutritious and incredible breakfast with three, yes three Superfoods (some may say four if you count the cinnamon)! And the best part, it tastes like pie. 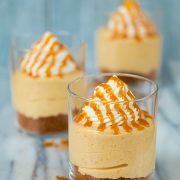 I will admit there is quite a bit of sugar in this recipe but if it didn’t have it just wouldn’t be near as good. At least it has a lot less than the real thing =). Many of us are always labeling recipes with “Christmas morning breakfast,” well what about Thanksgiving or even Halloween breakfast? The other holidays should have their own fancy breakfasts too, and I think this would make the perfect fit. 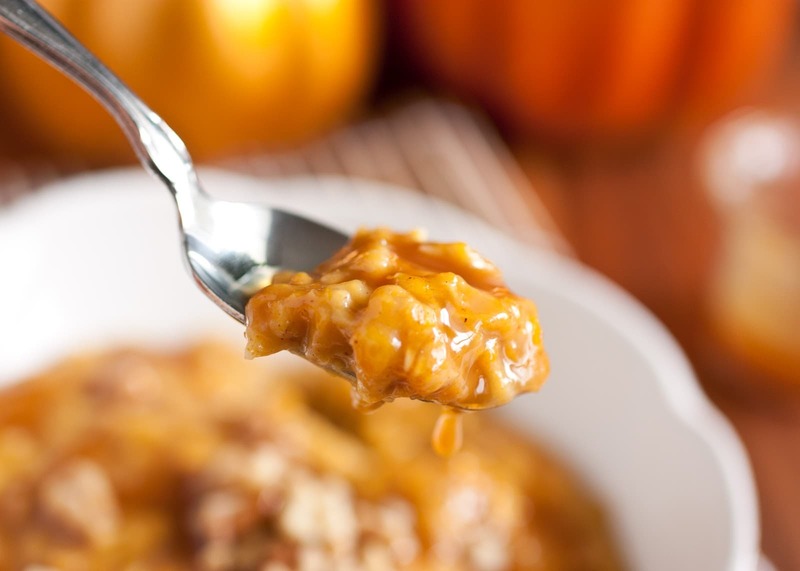 Indulge a little and be sure to get a drizzling of the caramel sauce with every bite. 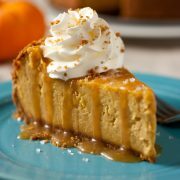 In my opinion a pumpkin pie shouldn’t be left without some kind of caramel sauce or dulce de leche, to me they are just meant to go together. That’s why I would say don’t omit the caramel sauce, it’s a must. It’s the highlight of this recipe. 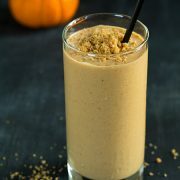 Enjoy and indulge in the flavors of fall! 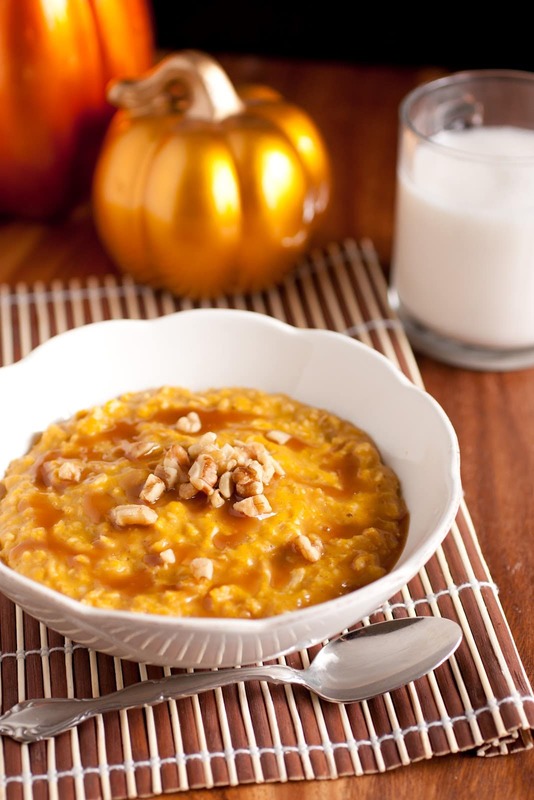 In a large microwave safe bowl, whisk together oats, milk, buttermilk, pumpkin puree, light-brown sugar, cinnamon, nutmeg, ginger and salt. Microwave mixture on HIGH power for 3 1/2 minutes, then allow oatmeal to rest a few minutes (for a thinner consistency, if desired, pour in additional milk or you could use half and half). Drizzle oatmeal with caramel sauce and sprinkle with optional chopped nuts. Serve warm.